The Acerbis TLD Limited Edition Full plastic kit for KTM is now available. Replacement set of plastics for your machine. Quality construction prevents cracking, fading, and chalking. 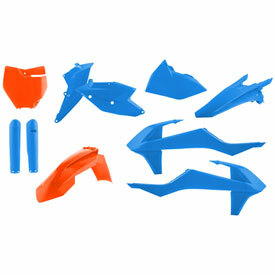 All plastic kits have the original factory shape and dimensions. Acerbis products really make the bike stand out. Excellent production quality made for an easy installation. 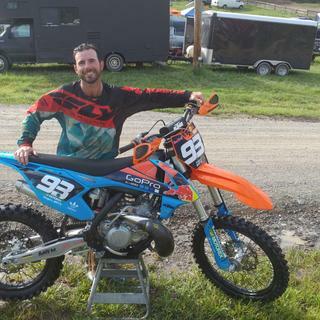 Acerbis does not make a TLD blue or orange air box for the 2015+ KTM 65, no reason given when I emailed them. I opted to cover the white stock air box with a locally sourced car vinyl wrap that matched the orange fender, the blue products the shop had did not match the TLD blue close enough for my liking. Plastics fit great except near the seat had to use pressure to get the seat to bolt down. Couldn't widen the holes because they are recessed and I'm not that talented. 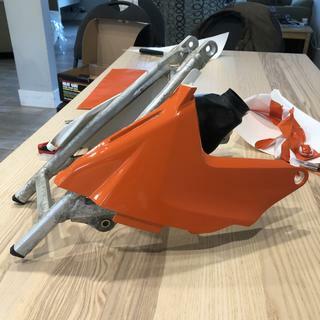 Looks so good and the fitment from Acerbis is always on point, especially with these ktm plastics that fit like perfect puzzle pieces! They finally came in stock and so glad I ordered them! Plastics are amazing, color combo is awesome! Just got to order graphics and I'll be set! This plastic kit is awesome. Fitment for an aftermarket kit is great. The newer KTM plastics fit together like a puzzle and these line up with all bolt holes. The look is amazing as it really sets your KTM apart from the rest. These plastics look positively SICK. IMHO they actually fit together better than the factory plastics. Be advised that air box cover came sans the grommet-doodad. I had to pilfer the grommet from the existing air box cover. really hoping these plastics will fit? BEST ANSWER: Everything should fit fine, just remember you will not be able to mount your tail light. What’s everyone doing about their airbox being white? Painting? Does Acerbis make a blue airbox? BEST ANSWER: I emailed Acerbis directly and they don’t make an airbox in blue or orange. 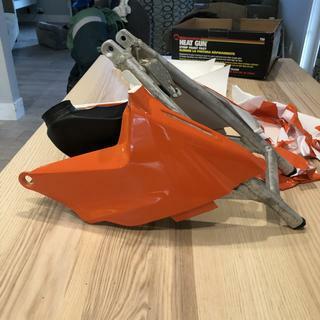 I went to a local vehicle vinyl wrap shop and bought a yard of highly flexible orange vinyl that matched the front fender and number plate, I took the number plate and fork guard with me. I went with orange because it was far enough away from the number plate and front fender that if it wasn’t a perfect match it shouldn’t have been noticeable. I didn’t find a perfect TLD blue. There’s no manufacturer name on the product label. No Acerbis does not make the stock airbox's in other colors. If I break a radiator scoop, are they available as a pair, or do I have to buy the whole kit? BEST ANSWER: Once we have enough inventory in stock so we can break down some kits then that answer would be yes we have replacement pieces. But we have yet to have enough inventory to break apart some kits. I would say in 45 days we will be able to break down some kits. Still no replacements available. Pretty expensive to have to buy a whole kit! Will it fit on 300 XC-W 2017? BEST ANSWER: It will fit except it will come with a MX style rear fender. Thanks!! what is the difference between a MX style and XC style rear fender? MX (Sx/SXF) and XC rear fenders do not have a tail light. XC-W use a taillight, so our mx fender in that kit you will not be able to use your tail light. Thank you!! i love the color, but i need the light to be legal on the trails around my area. any plans to make a taillight version of the TLD kit? Will this fit 2015 250sx? BEST ANSWER: To see if this part will fit your machine please enter the make, model, and year into our "Choose a vehicle" drop down boxes found above the product image. If your machine is not listed, we may not carry the right item for your application. If you have a 2019 year model but don't see your machine as an option, please contact a tech via Live Chat or call us at 1-800-336-5437 for assistance. Where do I buy replacement blue shrouds? BEST ANSWER: Unfortunately at this time, we only offer the complete kit. If you would like, you may be able to call Acerbis directly for replacement pieces. You can reach them at 1-800-659-1440. Will this fit a 2016 250sx? BEST ANSWER: No it will not, the 2016 SX250 had the last generation plastics, 17-18 SX250 fits. Will it fit a 2016 sx250f? 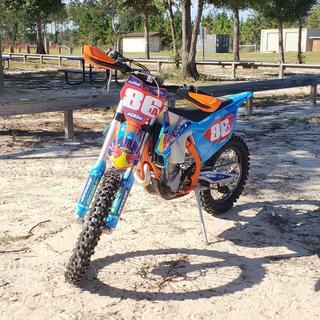 Where can I purchase the TLD graphics to go with the blue plastic? BEST ANSWER: You need to call N-style, they make them. N-Style's graphics are very similar to the TLD team graphics, but are not the same. They do not have the Red Bull logos due to !icensing issues. You asked about TLD graphics and yes they print and sell those with the Go Pro logo replacing the Red Bull logo. Factory KTM Red Bull graphics, you are correct they can't sell those and nobody 'legally' can make those. 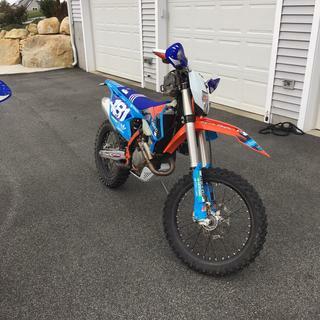 Will this kit fit 2015 ktm 450 sxf ? Will this fit a 2016 Ktm 250 xc? BEST ANSWER: No, the 2016 XC's were the previous style of plastics. Nothing will fit except lower fork covers. BEST ANSWER: It is the OEM color KTM orange. BEST ANSWER: It will all fit except the rear fender is different compared to the EXC/XC-w and the MX bikes.